DOHA, Qatar, 2017-May-10 — /Travel PR News/ — Qatar Duty Free (QDF), in partnership with HMSHost International, the leading company in providing the best dining experiences for travel venues, is pleased to announce the opening of two new restaurants in the North Node of Hamad International Airport (HIA). Burger Federation, a casual dining concept, opened its doors to travellers in the North Node of HIA’s main terminal serving burgers that have been reinvented as contemporary gourmet cuisine. HMSHost responded to customers’ growing demand for high-quality meat, serving both locally and internationally-inspired burgers made from premium angus beef and the finest fresh toppings. 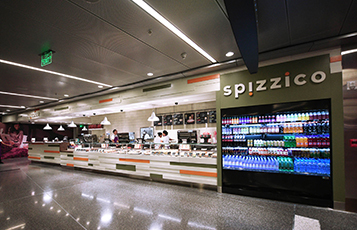 Guests will also be welcomed at Spizzico, a quick-service, contemporary bread and pizza bakery offering a wide assortment of gourmet pizzas, freshly baked paninis, pastries and salads. HMSHost operates international brands and proprietary concepts in more than 100 airports around the globe, including 20 of the busiest airports in North America. Through its HMSHost International division, the company has food and beverage operations in 18 European airports and 21 other airports across the Middle East, Asia, and the Asia Pacific region. QDF is a leading duty free operator in the Middle East, offering its customers an extensive range of international brands, from exclusive luxury boutiques featuring premium designers, including leading luxury brands including Moncler, Bally, Burberry, Coach, Hermès, Hugo Boss, Rolex, Bulgari, and Harrods, all catering to discerning passengers’ desires. Qatar Duty Free (QDF) operates the retail experience at Hamad International Airport (HIA) in addition to an outlet at Doha Port. The innovative, award-winning duty free operator has enjoyed consistent double-digit growth year-on-year and is now the second largest duty free operator in the Middle East. QDF scored a hat trick at the Duty Free News International Global Awards in 2015, receiving three prestigious awards: Global Travel Retailer of the Year (for the third consecutive year); Airport Travel Retailer of the Year; and Best New Shop Opening for its Marmalade Market concept. QDF also collected the Best New Store prize for its Samsung Experience space at HIA in the DFNI 2015 Product Awards. The travel retailer was also awarded Best New Fashion and Accessories Promotion for the live QDF Giorgio Armani autumn/winter 2015/2016 catwalk showcase. QDF is the proud sponsor of Qatar ExxonMobil Men’s Open, Commercial Bank Qatar Masters Golf Championship, Qatar Total Open women’s tennis tournament and Doha Rugby 1st XV. At Hamad International Airport, Qatar Duty Free offers 40,000 square metres of combined retail, food and beverage facilities, establishing the retailer as a premier shopping and dining destination. With more than 70 retail outlets offering an unprecedented selection of designer labels, fashion, electronics, gourmet foods and much more, QDF at Hamad International Airport caters to all tastes and needs. In addition, more than 30 cafes and restaurants offer a sumptuous selection of global and local cuisine. HMSHost is a world leader in creating shopping and dining experiences for travel venues and is part of the Autogrill Group – the world’s leading provider of food & beverage and retail services for people on the move. HMSHost operates international brands and proprietary concepts in more than 100 airports around the globe, including the 20 busiest in North America. Through its HMSHost International division, the company has F&B operations in 18 European and another 21 airports across the Middle East, Asia, and the Pacific. This entry was posted in Airlines, Airports, Business, Food & Drinks, Travel, Travel Management, Travelers and tagged Burger Federation, Luis Gasset, Qatar Duty Free, Spizzico restaurants, Walter Seib. Bookmark the permalink.